I have no real strategies for you, if that’s what you’re looking for, because I really think this one of those: no-one-knows-nothin’ topics. But here’s a rundown of some of my covers (that’s I’ve had input into – other anthologies that I’ve been in came with a cover attached). Of course I want my cover to look fabulous. But really, even more importantly, I want people to pick up my book. The first cover I had input with was Women of the Apocalypse. When I first saw the cover art, I was underwhelmed. Not because it was poor (it is very nice) but it just wasn’t what I was envisioning. It wasn’t bold. 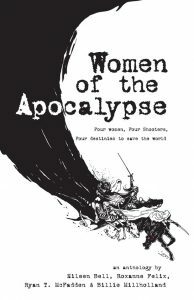 We had a book called WOMEN OF THE APOCALYPSE. And this art wasn’t very apocalypsy. But you know what? People pick it up ALL THE TIME. On a crowded table, people pick it up. Therefore, it was a favourite cover of mine. I really think the title obviously helps. Women, in particular, will pick this up on a table full of books (men pass it by). 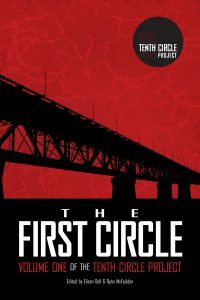 Fast forward to the 10th Circle Project and this was our first offering. I *LOVED* this cover. It was amazing. It was everything we had hoped for (and more). And yet, this one fell flat with readers. They just wouldn’t pick it up. I’ve been told (don’t know how true these are): many men cannot see red; it was too masculine; it looked like a technical manual. Therefore, this cover was a failure (even though I liked it). The genre of this one is SF noir. So we were looking for some foreboding atmospheric designs. After that was the Puzzle Box. Again, love this cover but no one really picked it up off a crowded table. 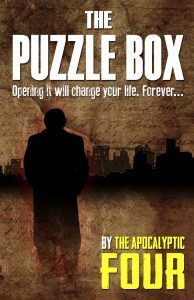 Perhaps it was the title (the Puzzle Box really doesn’t elicit much in the way of imagery). Plus, the Apocalyptic Four (while catchy) I think isn’t clear enough. What does that mean? Unless you know that there were four of us, and as a marketing gimmick we called ourselves the Apocalyptic Four….and the back cover blurb. In other words, I think the cover was good but I don’t know if the rest of the package was sufficient. They may’ve been the problem and not the cover at all. So now we come to Cursed: Black Swan. I’ve had two covers. I think both are amazing. The first version wasn’t gaining traction. I had lots of marketing and advertising going, and I believe that the front blurb and jacket description were good. So my publisher Gwen Gades of Dragon Moon Press (cuz she’s awesome) did up another cover for me. We’re going to see how this second cover does. I wonder if the title might’ve turned people off. 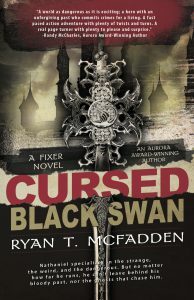 My original title was Curse of the Black Swan…which ended up not working for various reason (plus the first Pirates of the Caribbean is called Curse of the Black Pearl). We played on the term Cursed, though I was fearful that some might’ve though it was too much like a vampire novel. The sword and castle should take care of those issues. Anyway, just about to start another round of marketing with this new cover, so we’ll see how this one performs.